Artist's concept of Mars One astronauts and their habitat on the Red Planet. 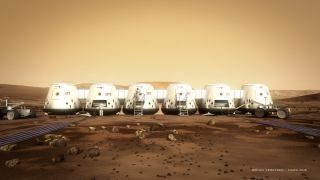 The nonprofit Mars One announced on Aug. 5, 2014 that it's starting a program called "Mars Exchange" to answer questions and spur dialogue about its ambitious colonization plans. A private Mars colonization effort is about to get more interactive. The Netherlands-based nonprofit Mars One, which aims to land four settlers on the Red Planet in 2025, has launched a new project called "Mars Exchange" to help answer questions and spur discussion about the group's ambitious plans. "Mars Exchange will foster a worldwide dialogue and encourage thought-provoking conversations on the subject of the human permanence on Mars," Mars One co-founder and CEO Bas Lansdorp said in a statement. "Mars One advisers, NASA scientists, Mars One team members and even a Nobel Prize winner will contribute." Mars One hopes to blast four astronauts toward the Red Planet in 2024 as the vanguard of a permanent colony. Four additional colonists would arrive every two years to augment the settlement. The organization plans to launch a series of unmanned Mars missions in the coming years to prepare for the arrival of people. The first of these, which is scheduled to lift off in 2018, would demonstrate key technologies required for a human mission and place a communications satellite in Mars orbit, Mars One representatives have said. Mars One intends to pay for its activities primarily by staging a global media event around the entire colonization process, from astronaut selection through the settlers' time on Mars. Astronaut selection is ongoing; in May, the group announced that it had winnowed its stable of candidate colonists to 705 from an initial pool of more than 200,000 applicants.